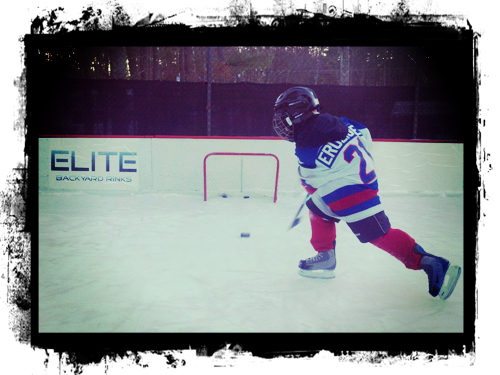 We are a backyard rink company based in New Hampshire, USA. We design rinks, we install rinks, and we sell rink parts and supplies to rinkbuilders who go it alone. But beyond that, we sell memories. Memories of wobbly-ankled toddlers standing up on their own for the first time. Memories of New Year’s Eve skating parties under the stars, flanked by friends and family. Memories of Stanley Cup-winning overtime goals scored by 12-year-olds on Sunday afternoons. Backyard skating rinks are unique in that they tend to ignite memories that last forever. And we run our family-owned business solely to see to it that as many families as possible are able to enjoy and experience their own backyard rink. If this means we design and build your rink for you, great. If it means we sell you the parts so you can build one yourself, that works too. But if it means that you just need to chat on the phone for a half hour so we can answer your questions, well that’s perfectly fine as well. We’re a backyard rink family, and we want you to become one too. So shoot us an email or give us a call, and let’s get started on your backyard rink memories today.